Human migration is people moving from one place to another to stay there. It often happens in large numbers. Migration can be within countries or between countries. Humans are known to have migrated extensively throughout history and prehistory. Sometimes, the movement is voluntary, but sometimes, people are forced to move. They may suffer warfare, religious and political persecution, famine, and other natural disasters. When people are forced to move, they are refugees. Many refugees are illegal immigrants and more than half are children and women. They may live in extreme poverty, lacking food, shelter, clothing, education and medical care. Rural-urban migration, or urbanization, is the movement from country areas to towns and cities. There are many reasons for people leaving the countryside. Often, they are overpopulation, high birth rates, and starvation. Mechanization has caused a reduction in jobs available in the countryside. Farming is hard work, with long hours and little pay. Many are subsistence farmers. In developing countries, a lack of money means a lack of machinery. Natural disasters, such as droughts, hurricanes, floods and volcanic eruptions, destroy villages and crops. There is a lack of services like schools and hospitals in the countryside. People move because they are looking for better-paid jobs and a higher quality of life. They have a better chance of services such as schools, medical treatment and entertainment. People are also attracted often by the advantages of a cosmopolitan lifestyle such as shops, restaurants, theaters, and nightlife. Many arrive with little money and so canmot buy or rent a house, even if one is available. They must usually make a temporary shelter with cheap or usef materials. Some give up and go home. Many children of migrant worker struggle for education. In the new country, they often are not integrated and are treated like an underclass. However, they are needed even if the local population doe not like immigrants because they compete for the same jobs. More people means more traffic and more crime. Immigrants help to build up cities, provide cheap labour, invest money, buy products and services, pay tax, and help companies compete. 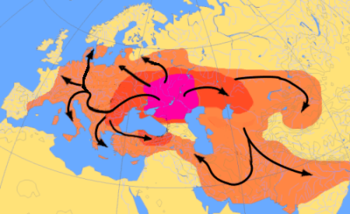 The Proto-Indo-Europeans migrated many times between 4000 and 1000 BC, according to the Kurgan hypothesis. The purple area corresponds to the assumed Urheimat (Samara culture, Sredny Stog culture). The red area corresponds to the area that may have been settled by Indo-European-speaking peoples until about 2500 BC, the orange area until about 1000 BC. The movement of populations in modern times has continued under the form of both voluntary migration within one's region, country, or beyond, and involuntary migration, which includes slave trade, human trafficking, and ethnic cleansing. The people who migrate are called migrants or, more specifically, emigrants, immigrants or settlers, depending on the historical setting, circumstance, and perspective. This page was last changed on 28 May 2018, at 20:11.